The Stop Underrides! 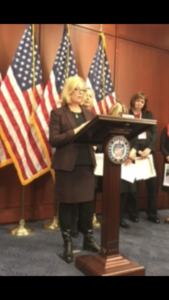 Bill was co-lead and introduced 12/12/2017 by Senator Gillibrand and Senator Rubio in a bipartisan effort to stem the tide of truck underride fatalities. It’s not a new problem! For more than fifty years, vulnerable road users (VRU’s), motorcyclists and vehicle passengers have been crushed and killed when they get trapped under a trailer. It happened to my daughter, to the Karth daughters and countless other souls. Underride can happen to anyone…at anytime…in any place. How can you help? Join Team Stop Underrides! Send us an email letting us know you’ll support this life saving legislation. Please call your Senators and representatives to express support. Let your legislators know that you want them to endorse the Stop Underrides Act! 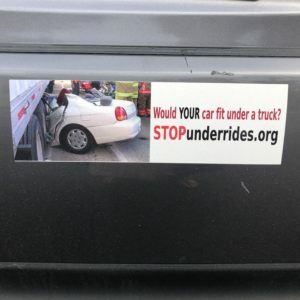 Ask for a Stop Underrides bumper sticker to help spread awareness. Reach out to family, friends, neighbors and coworkers – ask them to disseminate information to their network of family and friends. Ultimately, it’s those that share the road with tractor trailers that will decide if they want to protect loved ones from truck underride. Life is precious – please help us mitigate the risk of death by comprehensive protection around tractor trailers! 11-19-15. I lost my 31 year old son Bobby Alfano to an under truck crash. The vehicle went completely underneatg and out the opposite side. My father was killed in an under ride in 2010. The driver of the truck had his trailer blocking a two lane highway with no lights on his uninspected trailer at night. No flagger, cones or flares were put out by the driver on the north bound side but had his brother blocking traffic on the south bound side. With that said I believe that the last thing that my father saw was the south bound traffic lights shining under the trailer as of it was on coming traffic. I fought this truck driver and his insurance company for 5 years. I saw your organization on the news today and started to cry,because the manner in which my father died could have been prevented with such a simple barrier. Insult to injury the local newspaper shared with the county a picture of my dad’s dead body exposed on the front of the page before he was removed from his minivan. I pray for the organization and all who have been affected.